True to Seed or Not? It sounds ideal to be able to enjoy a fruit or berry, and if we find any seeds, to plant them and create a new plant of our own from which we can harvest the exact same variety of tasty treats. Works fine with tomatoes, as any seed saver would attest to! Unfortunately, Nature is more complicated than that. Many productive plants are not true to seed, meaning that the seeds from a particular variety of fruit for example will grow into a tree which WILL NOT produce the same fruit as the parent tree, but something which may look or taste completely different. Why? Plants need to produce genetic variation and diversity in their offspring to ensure survival of future generations. There are exceptions, some plants and trees will grow ‘true to seed’, producing exactly the same fruit or berries as the parent plant, and therefore can be grown from seed, which we’ve discussed in the previous article – The Difference Between Seedling, Grafted and Cutting Grown Fruit Trees. At this point you’re probably wondering how it works with grapes, so here’s the definitive explanation! Grapes come in both seeded and seedless varieties, so it stands to reason that seedless grapes need to be propagated by any means other than seed, and the industry standard method of propagation is the use of hardwood cuttings in late winter. Seeded grapes do contain viable seeds, and planted in autumn will produce grape vine seedlings in spring. They need to be planted early because they require cold stratification, exposure to cold temperatures which will cause the seed to break out of dormancy. Sounds good? So what’s the problem then? Well, to put it bluntly, there is a lot of inaccurate, cut-and-pasted misinformation all over the internet, especially on the topic of growing grapes from seed! Let’s look at an example which is probably the worst offender in this respect, which has been doing the rounds in the Permaculture world for the last decade – enter the ubiquitous Concord fox grape! The permaculture community is quite fond of Concord grapes almost as much as they are of swales and herb spirals, and there are so many discussions centred around growing this grape variety from seed. What’s so special about this grape you may ask? The Concord grape is a native American grape variety, it’s Vitis labrusca ‘Concord’ which is a different species to the European grape Vitis vinifera. It’s a cold tolerant and tough grape variety which is used for making grape juice and grape jelly. By the end of the 19th century (i.e.e the 1800s), it was the most commonly planted grape in the US. These purple grapes are thick-skinned with large seeds. The pulp, which is sweet, with a strong grape flavour, separates easily from the skin but clings to the seeds. Once the first truly successful commercial grape in the US, by today’s standards of cultivated grapes, it falls way short. So let’s look at the history of the Concord grape to get the facts straight! The Concord grape, Vitis labrusca ‘Concord’ is a cultivated variety of the US native wild grape Vitis labrusca hybridized (crossed) with the European grape Vitis vinifera, being genetically one-third of the latter by parentage. This clearly tells us that the Concord grape variety was developed from a wild fox grapes seedling, which was then crossed with other wild fox grapes seedlings to produce this cultivated variety. It’s actually the same way all new grape varieties are always produced. So what does this tell us? Well, to cross seedlings, they need to be different. Therefore, wild, seed-grown fox grapes have different qualities and properties from plant to plant, it’s what we call genetic variation in biology. What happens if we take seeds from a Concord grape and plant them? 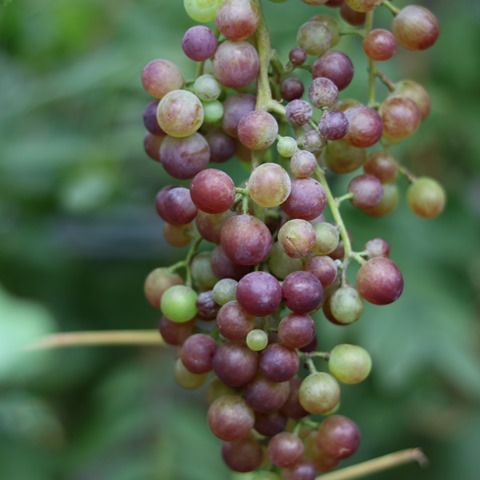 We’d create new genetic fox grape variants, WHICH ARE NOT CONCORD GRAPES! They will be some other form of Vitis labrusca or hybrids of them. Think about it, if it was possible to sow fox grape seeds and create the same tasting fox grape, it would have been impossible for Ephriam W. Bull to create a new variety in the first place, as they grapes would never change… And the seedlings are all different, and it really does matter that they’re different, as he apparently had to evaluate more than 22,000 seedlings to find the variety which would be named the Concord grape. If it didn’t matter, he obviously would not have gone to that much trouble! Note, the reference to grafting V.vinifera (European) varieties for protection against root phylloxera is only applicable to certain locations and soil types around the world, such as Tennessee in the US. European grapes grow just fine on their own roots in Australia for example, and this is how they’re grown commercially and in viticulture. This should hopefully settle the matter and clear up a lot of the misinformation on the subject. To summarize, technically, we can grow grape vine seedlings from seed, but they aren’t the same variety as the parent vine. It’s a genetic gamble on what they will turn out to be, so unless we have plenty of space to waste and are happy to wait at least two or three years to find out what the grapes taste like, it’s kind of pointless, as the grapes may not be very palatable, or may not be edible. So, unless you’re attempting to breed a new grape variety, don’t grow grape vines from seed, grow them from hardwood cuttings or graft them if they can’t grow on their own roots in your location. Considering grape vines will fruit for many decades, and are quite cheap to buy, perhaps it may be way easier to just buy a growing grape vine of known variety from a garden nursery! They will pay for themselves many times over in their lifetime. Want to propagate your own grape vine? It’s very easy. Grapes can be propagated from cuttings taken in late winter, this prevents the cuttings from drying out during the drier winter periods. Use year old growth material for cuttings, which has matured at the end of the growing season. The wood at the end of a cane should be well matured and hardened off, without green tips. Cuttings should have at least 3-4 buds, but not more than 6-7. A good length is around 30cm (12”). To identify the top and bottom of the cutting, cut the top fairly flat and the bottom end (root side of the plant) at a sharp angle, as the cuttings won’t root if planted upside-down! It also makes it easier to push them into the propagating medium. Dip the bottom ends of the cuttings into rooting hormone – this is optional and not necessary. Fill a deep pot with a suitable propagating medium such as potting mix (or dig a narrow trench in the ground and loosen the soil if propagating in the ground). TIP: Coconut coir also works really well as a propagating medium. Take each cutting and push it into the propagating medium so that only the top two buds are unburied. Keep the propagating medium/potting mix barely moist and locate the pots of cuttings in a sheltered, protected location which preferably gets morning sun and dappled midday sun to prevent the cuttings from drying out when the leaves first emerge in spring. 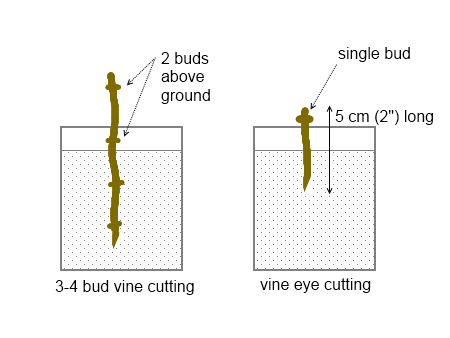 You can also take very short cuttings with only one bud known as vine eyes. Make a cut 6mm (1/4”) above a bud, then make another cut 5cm (2”) below it to complete the cutting. It’s a way of making a limited amount of propagating material go much further to produce more cuttings. When propagating grapes, it’s more efficient and productive to put many vine cuttings into a larger wide container, rather than potting up cuttings singly. When the cuttings put out their new leaves and begin to develop a decent root system, they can be transplanted into their own pots and left to grow on there. Don’t be inpatient and attempt to repot the cuttings too early, as too much root disturbance can cause the cuttings to fail. It is advisable to let the cutting grow in their pots for a year to develop really strong roots before planting them out into the groundin late winter. This entry was posted in Gardening Information, Permaculture, What's New! and tagged can you grow grapes from seed, concord grapes, garden mythbusting, grape seedlings, growing grapes from cuttings, Permaculture, seed grown grapes, true to seed, vine eyes, Vitis labrusca, Vitis vinifera. Bookmark the permalink. 3 Responses to Can You Grow Grapes From Seed? Garden Mythbusting! I just wrote about this in regard to citrus and avocados, which are not only genetically variable, but start from seed with juvenile growth. Some citrus seedlings can be nasty with thorns! Yes, the trifoliata citrus rootstock (Poncirus trifoliata, or trifoliate orange) has shocking large thorns. You sometimes see gardens where the citrus tree has died above the graft and the rootstock has taken over, or the rootstock has thrown up suckers which have overgrown and taken over, it’s just a horrible thorn bush! Oh, that is a nasty one; and some grow it as an ornamental! That seems crazy to me. Supposedly, it is quite striking if pruned to expose the branch structure and thin it out a bit, but those who grow it never seem to get around to pruning it. I have never seen a pretty one.